Finally a reason to watch hockey. Although many Philadelphia Flyers fans cheered and clapped as Sarah Palin took to the ice at the Wachovia Center on Saturday night to drop the ceremonial puck kicking off this town&apos;s NHL season, their warm reception was no match for the 90 seconds of sustained booing that rumbled through the arena, drowning out most of the cheers in support of the Republican vice presidential nominee. As Palin stepped onto the ice before a capacity crowd to drop the puck, joined by her daughters Willow and Piper, the arena&apos;s jumbotron flashed a futile message to the thousands of notoriously harsh Philadelphia sports fans in attendance. "Flyers fans, show Philadelphia&apos;s class and welcome America&apos;s #1 hockey mom, Sarah Palin," the massive electronic message board pleaded, to little effect. 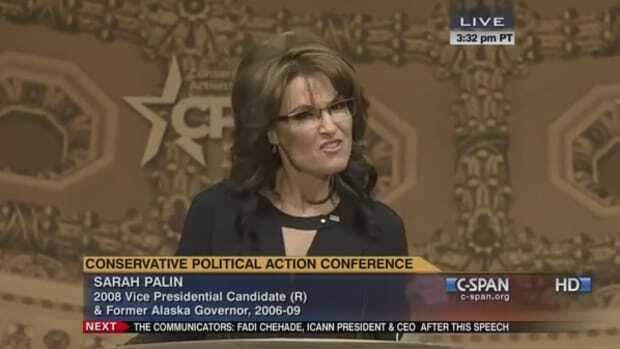 Booing quickly erupted when the smiling candidate emerged from a tunnel leading onto the ice, muffling the applause of any Palin supporters in the crowd.